Hi everyone and welcome! 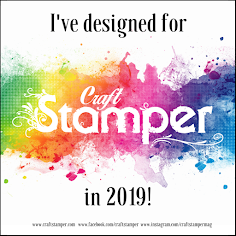 I was really excited when Donna Bowman invited me back to be a Guest Designer for The Mixed Media Monthly Challenge 2nd Birthday celebrations. 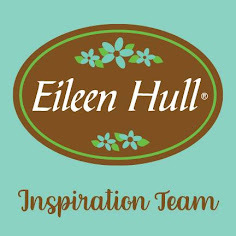 If you've not yet visited this challenge blog then I highly recommend it as they have superb designers on board who create a wealth of mixed media art each month to inspire you. And quite by chance it's a thrill to announce that this month will be sponsored by The Funkie Junkie Boutique!!! The design for this canvas has been in my head for a long time but it was the arrival of my invite that gave me the perfect opportunity to create it. I was inspired by the beautiful artwork shown on the Mat Minis Birds & Their Houses packaging created by Wendy herself. The Mat Minis are so easy for adding dimension in themselves but the idea of replicating the tree to create a dimensional woodland scene was exciting. The base of the canvas was covered with white embossing paste, dried and coloured just a little with a mix of Cornflower Blue Archival Reinker and rubbing alcohol. Using the Layered Tree stencil I added leaves and branches in various blue, green and brown shades of Archival Ink, making sure they overlapped and graduated. Another layer of trees was created by smearing a little silver embossing paste through the stencil with my finger. If you then heat the paste it bubbles and sets before being coloured by the same inks. And then I repeated this process using the white embossing paste for a completely different texture/layer. The joy of using the stencil throughout this process is that you can easily go back over trees you've already created to add more colour or embossing paste and build as much dimension as you want. Again inspired by Wendy's original artwork I added 'berry clusters' using Rose Gold Liquid Pearls as a finishing touch. One thing I've learned from Wendy's tutorials is that you can continue to add delicate detail to your artwork using her background stencils - it covers overly blank spaces without intruding heavily on the main design. A stamped lace border edge also fitted perfectly with Old Ledger pattern. 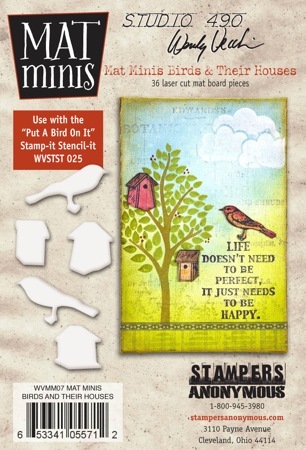 The bird houses and birds are so simple if you ink them up and use the coordinating stamp set to add the detail. Finally the sentiment banner just needed the addition of some filigree metal edges to make it stand out. 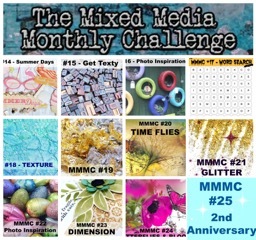 I really enjoyed putting this together and getting the chance to be a part of the 2nd birthday celebrations at The Mixed Media Monthly Challenge. 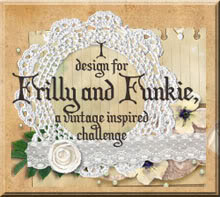 Make sure you hop on over to the challenge blog to be inspired by the rest of the designers and then its your turn to pick a theme. Oh what a happy looking canvas this is Jenny, love the forest effect with the trees going into the distance. The little birdhouses give it such a happy feel, perfect for that wonderful quote you chose! Great to have you guesting with us at MMM again! Charming row of trees and birdhouses. the texture on the trees is fabulous with the touches of gold. Congrats on your GD at MMM! A lovely Wendy-inspired scene - congrats on a fabulous guest spot! Congratulations on your guest spot ! Jenny and what a lovely canvas you have created. So pleased to see you have the opportunity to finally get that idea down on canvas to share with us as it certainly needed to be just that -shared , admired and loved . It really is a gem . This is just fantastic, Jenny! So many lovely details. Very interesting piece. Beautiful colors and great use of art parts. Love the whimsical forest and those birdhouses and tiny bird. Great little detail: those Liquid Pearl cluster! Congratulations on your GDT; they and we are so blessed they chose you! Hugs! OHhhh so fun and really DARLING Jenny. Did you know that this really could be reality Jenny!! We have 50 bluebird houses here at the ranch!!!! Your trees totally DELIGHT me - smiling big - they are PERFECT with the shimmer and bling. And each little house is PRECIOUS - I love that none are exactly the same and are at different heights. SUPER DIMENSION. And YOU are a WONDERFUL Guest Designer - of course!!! Xj. Beautiful! Love how you used Wendy's stamps here! This so says comfort and summer! Wonderful!